A few years ago, my book club elected to read Alcatraz vs. the Evil Librarians, which proved to be a terrible mistake. 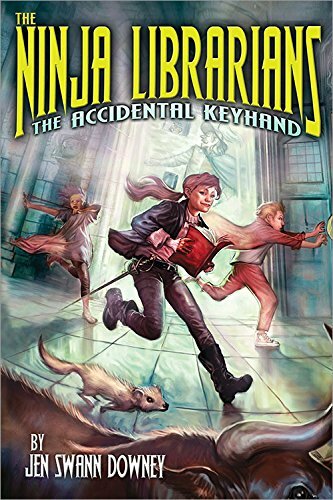 I think the book we were actually looking for (although it hadn’t been written yet) was The Ninja Librarians: The Accidental Keyhand by Jen Swann Downey–full of awesome, sword-wielding, time-traveling Lybrarians. In the middle of the Pen and Sword Festival at their local library, Dorrie and her brother Marcus stumble through a strange door and find themselves in Petrarch’s Library, headquarters of the Lybrarians, who travel through time to defend anyone in danger due to something they wrote or said. Dorrie is convinced this is the work she was always meant for, and Marcus falls hard for a pretty Lybrarian. Although they are taken in on a temporary basis and begin to make friends, there are still suspicions that they could be spies for the evil Foundation, and questions left unanswered about how the doorway appeared in their local library to begin with. Dorrie is a great heroine, earnest and well-meaning but naïve too. At the beginning of the book she is desperate to perform great deeds and have heroic adventures—and is sure that her acting school swordfighting has prepared her for just such tasks. She swiftly realizes how much she has to learn, but fortunately (and somewhat conveniently) Cyrano de Bergerac agrees to take her on as a student (just don’t mention his nose, or that silly play about him). The time travel has interesting parameters, as Petrarch’s Library connects to specific libraries in specific time periods, enabling travel between eras in limited ways. It’s made clear that the Lybrarians are able to change history (do you remember the Foundation ruling the world during the Middle Ages? There’s a reason you don’t). Swann cheerfully slides past all the possible paradoxes this implies. Throughout the book, the Lybrarians are trying to save Socrates’ life, which is a nice goal in the short-term but no one really considers the ramifications… However, this is such a light, fun book that I don’t mind letting those details slide. One of the more unique aspects to the time travel is that it is, essentially, historical time travel. Dorrie’s library in 2014 is a century farther into the future than any other library in the system. Lots of time travel stories involve the present accessing the past or future (often both), or people from the future coming into the present, but I don’t feel like I’ve seen much about, say, people from Shakespeare’s day visiting Ancient Greece, without the ability to go into our future too. You may remember me raving about Libriomancer recently, and this book has some similarities to that one too—at least, to the extent that people can “read out” food from books, and sometimes animals too. Libriomancer has an elaborate magic system with very specific rules, addressing ramifications and challenges that this book blithely ignores…but like the time travel paradoxes, this is such a gleeful romp that I don’t much mind. There’s an appendix in here too which I’d recommend at least skimming; Swann pulled in historical figures from many eras to inspire characters. I didn’t recognize most of them, so it added an interesting layer to the book to read the background. This is clearly set up as the first of a series, although it does come to a satisfying conclusion…with lots of opportunities remaining still for later stories, and I’ll definitely be watching out for more books! I don’t often run across books that make me grab all of my book-loving friends and say you must read this, but I’ve been doing that with Libriomancer…and now I expect to make the same rounds with Ninja Librarians. I already talked my book club into choosing it for our August read! Blog Hop: Replying to Comments? I wouldn’t call this a copycat book at all–and I didn’t mean to imply it was! I think it’s more that my book club was expecting something from Sanderson’s book that it wasn’t really, and this book turns out to be much closer to what we had imagined! I actually read WIZARD’S HALLand there were a few things about it that were similar, though Yolen’s book was terrible, I thought : / I’m pretty sure J.K. said she’d never read it.